The Venus Project presents a bold, new direction for humanity that entails nothing less than the total redesign of our culture. There are many people today who are concerned with the serious problems that face our modern society: unemployment, violent crime, replacement of humans by technology, over-population and a decline in the Earth’s ecosystems. As you will see, The Venus Project is dedicated to confronting all of these problems by actively engaging in the research, development, and application of workable solutions. 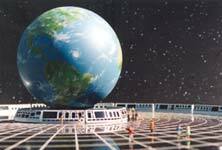 Through the use of innovative approaches to social awareness, educational incentives, and the consistent application of the best that science and technology can offer directly to the social system, The Venus Project offers a comprehensive plan for social reclamation in which human beings, technology, and nature will be able to coexist in a long-term, sustainable state of dynamic equilibrium.